Summary and Definition: The peace Treaty of Ghent was signed on December 24, 1814 between Great Britain and the United States of America and concluded the 32 month War of 1812 which ended in a stalemate. Also refer to Facts about the War of 1812. News of the peace Treaty of Ghent took weeks to reach the United States due to the poor communications of the era. American forces under General Andrew Jackson scored a Important victory at the Battle of New Orleans in the War of 1812 on January 8, 1815, after the Treaty of Ghent was signed. 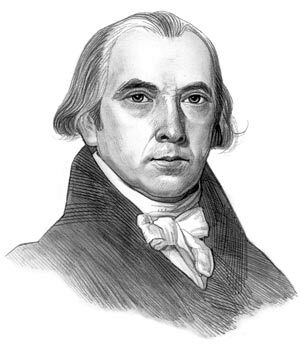 James Madison was the 4th American President who served in office from March 4, 1809 to March 4, 1817. One of the important events during his presidency was the Treaty of Ghent. Treaty of Ghent - Where is Ghent? The Treaty of Ghent was named after the place the peace treaty was signed. Ghent is a large city and port in the East Flanders province of Belgium. Why was the Treaty of Ghent signed in Belgium? Because Belgium was a neutral country. The Treaty of Ghent was negotiated in Belgium by John Quincy Adams and Henry Clay supported by Albert Gallatin, secretary of the treasury; James A. Bayard and Jonathan Russell, the charge d’affaires for President Madison in Paris. The British negotiators were led by Foreign Secretary Lord Castlereagh and Secretary for War and the Colonies, Lord Bathurst, a lawyer called Williams Adams, Lord Gambier and Henry Goulburn, the Undersecretary for War and the Colonies. The negotiators had their own goals that they wanted to achieve with the Treaty of Ghent. The goal of Americans was to restore things to the way they were before the War of 1812 - the "status quo ante bellum". (The Latin term 'status quo ante bellum' literally means "the state in which things were before the war.") The British negotiators had greater ambitions and wanted each side to keep what it had won during the War of 1812 - "uti possidetis". However, both sides need to achieve peace as the cost of the War of 1812 was too expensive to maintain. There was little gain but a lot to lose for both countries in a prolonged war. What were the Terms of the Treaty of Ghent? Despite Britain's original stance looking to benefit from the 'gains of war' the urgency to end the war overrode their initial goals. The terms of the Treaty of Ghent were that all hostilities would end and "all territory, places and possessions whatsoever, taken by either party from the other during the war" would be restored as they were before the war. The terms of the Treaty of Ghent released all prisoners and restored all captured lands and ships. It was the ' status quo ante bellum'. Results of the Treaty of Ghent: According to the Terms of the Treaty of Ghent all conquered territory was to be returned, and commissions (official groups) were planned to settle the boundary of the United States and Canada. The British government realized that there was no chance of conquering any portion of the United States. The United States gave up its designs on British territory in Canada. None of the things about which the War of 1812 was fought were even mentioned in the Treaty of Ghent. The subject of Impressment, which had been a Important cause of the War of 1812, was ignored. The terms included an empty clause that agreed to restore the Native American Indians "all possessions, rights and privileges which they may have enjoyed, or been entitled to in 1811". As there was not a clear map of Native land reserves these words in the Treaty of Ghent were worthless. Although the War of 1812 had ended in a stalemate and the terms of Treaty of Ghent were not beneficial to either the British and the Americans, the Treaty of Ghent did have some significance. Both Britain and the United States were able to expand their commerce and trade. Commissions had been planned to settle the boundary of the United States and Canada. The British had been forced to recognize the United States as an expanding national power. The Treaty of Ghent saw the destruction of the Federalist political party who were branded "traitors" following the secret Hartford Convention. The United States had grown confidence in the impact they could have on the world stage. The info about the Treaty of Ghent provides interesting facts and important information about this important event that occured during the presidency of the 4th President of the United States of America. The article on the Treaty of Ghent provides an overview of one of the Important issues of his presidential term in office. The following James Madison video will give you additional important facts and dates about the political events experienced by the 4th American President whose presidency spanned from March 4, 1809 to March 4, 1817.